My finger is hovering over the copy and paste button. I'm actually in the same boat as Arthur has been put on a no pellet diet. He thinks I have a bad memory and puts a lot of effort into reminding me that his dish is empty. 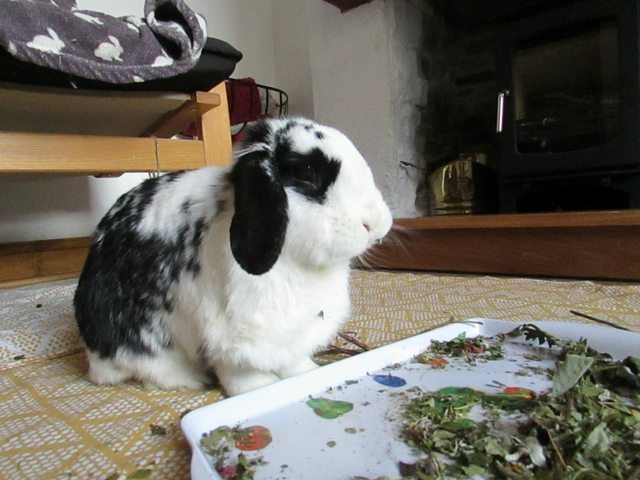 I really need to sort out some appropriate Grun Hopper type food for him in the longer term as he's been found to have bladder sludge so I really need to work on his diet. All the office bunnies are now on a no pellet diet with the added complication of Arthur being on low calcium. Oh Mouse I love that you flopped into your dinner. I think maybes J&B heard me refer to Diesel as "the perfect weight" & are fattening themselves up to get competative. If Diesel were to gain another 500g I will have 4 bunnies each at 2.8k . 2.8Kg? 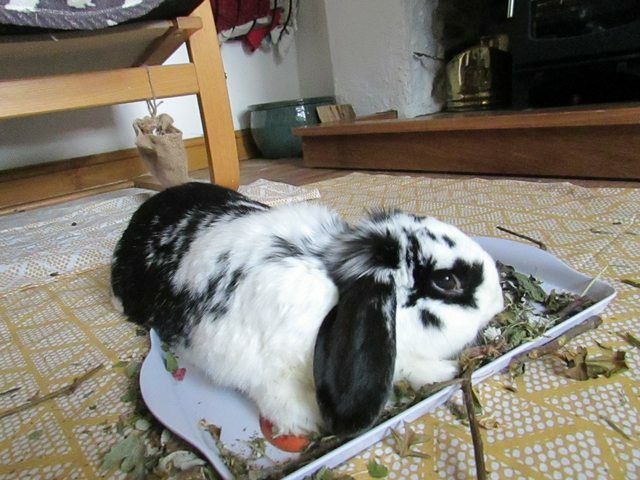 Oh, I'm going to have to get some photos of the big unit Lillian who is presently 'refurbishing' the cardboard snuggle area that she and hus-bun Henry share. She seems to want extra holes in the big box - but that's probably to get her hefty 4.5kg of muscle through! I love photos of Mouse, Joey and Boo. They are a beautiful trio and we just don't get enough photos of these gorgeous rabbits. I hadn't heard of this before, so have just had a look online. It looks very tasty, but it's certainly not cheap is it!? Do you intend to mix up your own? Nope, it's definitely not cheap - if money was no object my rabbits would be getting it regularly. I have no plan yet ... I was kind of hoping if I mentioned Grunhopper that someone would say something along the lines of "Do you know that Galens Gardens (or similar) do a similar product at a quarter of the price?"!! yeah, I know, wishful thinking. When I get time to study I need to go on such sites and work out the most economical way to buy tasty stuff like plantain and then probably mix it with about 50% Readigrass... then I'm still concerned about calcium in dried food so my proper intention when we get to summer is to feed fresh as that's the ideal. I have no patches of grass in my own garden so I really need to grow some alongside the plantain and dandelions etc I have for them. Any bun else cba to sit up for lunch? So cute! My Betty piggy does the same!